Graphs from Valerie Delpech's slides at AIDS 2018. Over three-quarters of deaths of people with HIV in London are due to non-AIDS conditions, with most occurring in people who were taking HIV treatment and had an undetectable viral load, Valerie Delpech of Public Health England told the 22nd International AIDS Conference (AIDS 2018) in Amsterdam this week. The leading causes of death were liver disease, cardiovascular disease and AIDS. All London HIV clinics submitted case-reports of all deaths among their patients that occurred in 2016. Clinicians were asked to provide details of co-morbidities, antiretroviral therapy (ART), clinical markers, cause of death and end of life care. Two doctors and a pathologist reviewed each case in detail for the London Mortality Study Group. There were 206 deaths in 2016, a comparable number to previous years. Three-quarters were in men and the median age at death was 56 years. At the time of death, 81% of people were on ART and 76% had a viral load below 200 copies/ml. Almost half (44%) of deaths were considered to be sudden and 36% to be unexpected. Among those whose deaths were unexpected, the leading causes of death were accidents and suicide (18%), cardiovascular disease (16%), AIDS-defining illnesses (14%), non-AIDS cancers (14%), stroke (10%) and non-AIDS infections (10%). Among the larger group of deaths that had been to some degree expected, the causes of death were liver disease (29%), AIDS-defining illnesses (27%), cardiovascular disease (13%) and non-AIDS cancers (10%). These figures are somewhat different to another recent analysis of mortality data, also conducted by Public Health England. However, that report related to a much longer and earlier period of time (1997-2012) and included more AIDS-related deaths. In the current study, people frequently had risk factors in the year before death, including smoking (37%), excessive alcohol consumption (19%), drug use without injection (20%) and injecting drug use (7%). Co-morbidities were commonly reported: depression (39%), high blood pressure (33%), raised cholesterol or lipids (27%), viral hepatitis (18%) and diabetes (14%). In only 48 cases had a discussion about end-of-life care and preferences been recorded in the patient’s notes. Among those whose death was expected, 61% died in hospital, with only 17% dying in a hospice and 15% at home. Delpech said this showed that improvements in end-of-life care planning are needed. Deaths could be avoided by expanding HIV testing, so that people do not have AIDS-related illnesses, she said. Moreover, optimal management of co-morbidities, health promotion to reduce behavioural risk factors and strong psychosocial support could prevent other deaths. Delpech V et al. 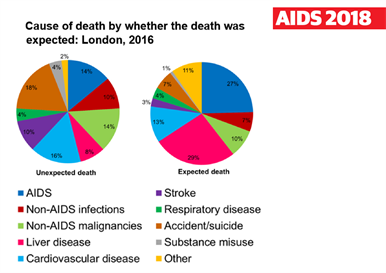 Mortality and cause of death among HIV patients in London in 2016. 22nd International AIDS Conference (AIDS 2018), Amsterdam, abstract TUPDC0106, 2018.